After almost a decade of being out of print, the modular, wet or dry erase gaming mats have returned through a Kickstarter campaign. Setting up a tactical map for tabletop RPGs or miniatures games can quickly become a huge headache for GMs. 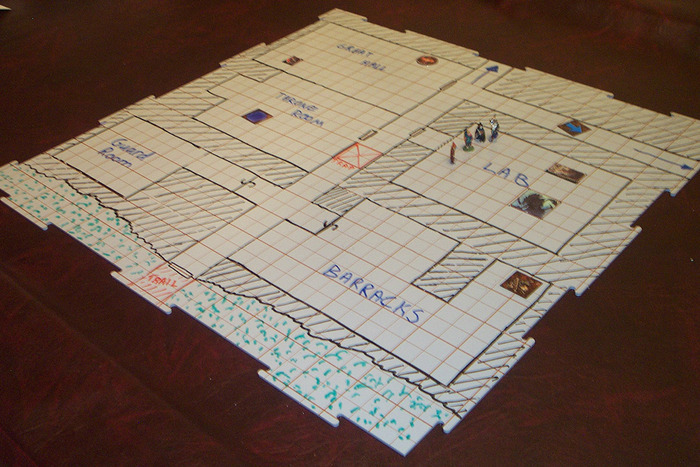 Official dungeon tile sets restrict the shape and size of your rooms, and large maps drawn on several sheets of printer paper are flimsy and hard to keep together. Revealing one room at a time on a huge gaming mat can be just as frustrating, especially when your players deduce the location of the secret room just from the areas the GM keeps covered (not that I'm bitter). Tact-Tiles promises to save you from that headache. BC Products' Tact-Tiles are rigid plastic squares that snap together. The tiles are available with a 1-inch square grid or as blank tiles, to support games with more abstract movement systems. 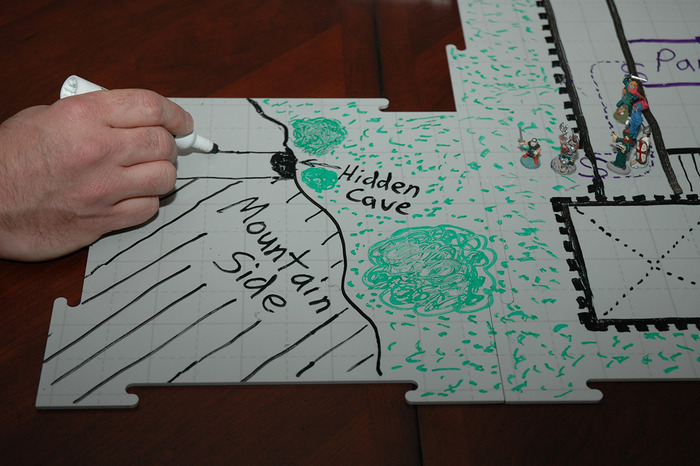 You use wet or dry-erase markers with the tiles, so that as older tiles become no longer relevant you can erase the details, move them to a new part of the map, and draw in the next part of the dungeon. The tiles are an eighth of an inch thick and measure 10.5" on each side. The Kickstarter campaign, launched July 17, runs until August 26. As of writing, the campaign has raised $26,631, almost 30% of its $90,000 goal. Tact-Tiles have been unavailable for purchase since at least 2007, after reportedly losing a crucial supplier. BC Products has partnered with Void Star Studios to bring the tiles back into production. The Kickstarter campaign will allow BC Products to manufacture the tiles at a reasonable price by producing a large volume of tiles. 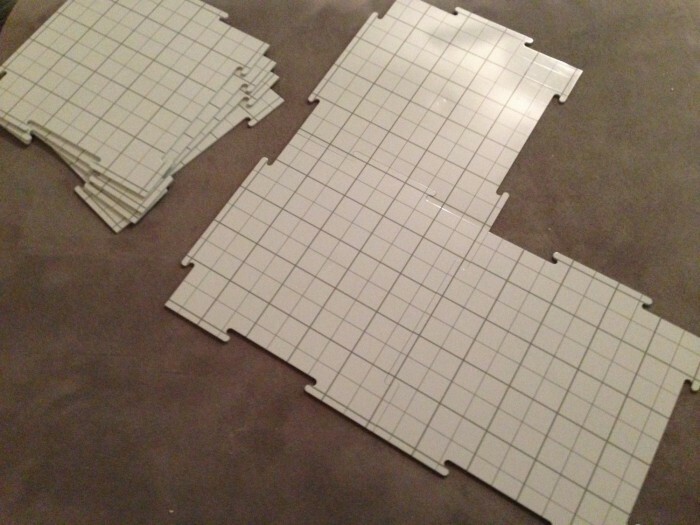 The original modular gaming grids has been well-loved by many, including fantasy author R.A. Salvatore, best known as the creator of dark elf Drizzt Do'Urden, and tabletop game designer Monte Cook. The new Tact-Tiles are compatible with the original production run, though the original tiles cannot be used with wet-erase markers. The smallest set, consisting of six blank tiles, is available at the $65 pledge tier. For tabletop gamers, like me, who live outside the US, be prepared to pay significantly more to cover shipping. Or, you can gently encourage your local games shop to back at the $2 retailer interest level. $65 for six pieces that, when assembled together, has a surface area that's smaller than your average 3x2 non-magnetic dry erase board? Cut that tier price in half and they'll get a lot more backers. Otherwise, I'd have to advise going to a hardware store, get some unframed dry erase board, and cut out your own pieces. $65 for the starter set? I just remembered why they went out of business. I like the idea, but for $65? I know there is a grid tablecloth that you can buy for about $35. If they really want this to sell, they have to cut the price. That price is insane, no two ways about it. Considerably cheaper options out there to achieve the same thing, for example the foldable whiteboard that is the size of an index card that unfurls to the size of 27 index cards in a square shape. I use a battlemat for my game that's served me well for years and probably cost around $35. It's nice and big (4' x 5'?) and has a quadrille grid on one side and a hex grid on the other, so it works for D&D, Champions, or whatever else I'm running. I don't like being negative, but I'm going to need to hear a lot more benefit from tact-tiles to justify the cost. Maybe if I took my game on the road more often? The over-sized poster tube I use for the battlemat is kind of a pain to transport.